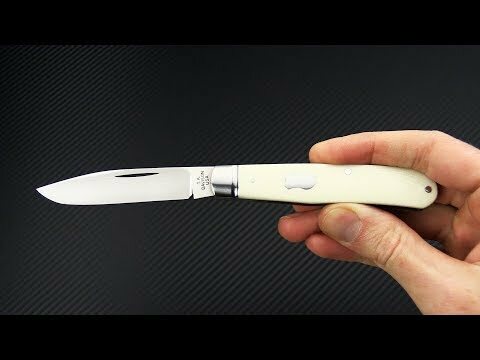 Todd Davison provides custom, traditional slipjoint pocket knives that are truly handmade and one of a kind. Having produced over 1600 slip joint knives, Davison utilizes premium materials and offers exceptional quality and attention to detail in a timeless, traditional design. This version comes with hand rubbed satin, CPM 154 drop point blade, liners and bolsters with Ivory White G10 covers. Blade: The Drop Point blade is finished in a hand rubbed satin finish with a distinct long pull groove for opening and marked "T.A. Davison" on the front tang. CPM154 sharpens beautifully and offers easy maintenance and excellent performance with the shallow, hollow grind provided. The swedge-equipped drop point offers a fine, finishing touch to this beautiful custom piece. Handle: Tough, modern and classy Ivory White G10 covers are fit to grooved, satin finished, stainless steel bolsters which are precision fit to the stainless steel liners. Delivering a truly custom feel the blade side liners have a coined edge with added file work on the inside of the back spring. Stainless pins are used to secure the covers and the display side has a stainless shield for a timeless feel. The back spring is smooth and solid with half-stop action and sits flush in all three positions. Pouch: Includes a fleece lined nylon zipper pouch for carry and storage. CPM154: CPM-154 is a particle metallurgy version of 154CM that benefits from the refinement in the PM process providing it with an increase in toughness and easy of finishing. CPM-154 takes a very fine edge and is highly corrosion resistant. Edge retention is going to be on-par with CPM S30V while being easier to resharpen. A great all-around blade steel.